Mom and Dad Fleefenbacher think their daughter Zoe’s hair is wild and beautiful. 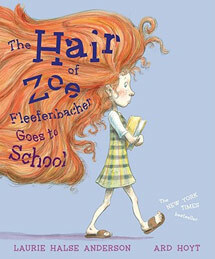 And for her kindergarten teacher, Zoe’s vivacious tresses were a comfort. But Zoe’s about to start first grade, and her new teacher doesn’t fool around…. So what are Zoe and her free-spirited hair going to do now? With exuberance and humor to spare, Laurie Halse Anderson and Ard Hoyt, the New York Times bestselling author and illustrator, tease up a terrific tale of hairy hijinks, classroom chaos, and the importance of teachers and students learning to work together.